"…and a real bonding experience. It's a challenge to find activities that parents can enjoy with their teenagers - this was the best!" 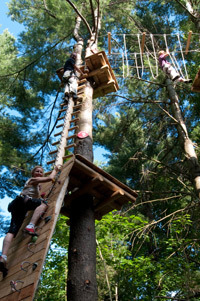 Each TreeGO® generally offers 50 to 70 aerial adventure activities divided into four color-coded courses for juniors and adults taking approximately 2-3 hours to complete. An additional TreeGO® course is especially designed for children, begining at 7-8 years old. All participants attend a brief training session where you'll be fitted into your harness and your guide will show you how to attach yourself to safety lines and zip lines. This training gives you the knowledge and guidelines to self-manage the simple equipment designed for your own personal safety as you travel through the course. TreeGO's ground patrol staff observes and guides you in the proper use of equipment from the pathways below the courses. These guides can also let you know where the course exit points are located at any time, if you want to get your feet back on the ground. You begin TreeGO® on the green course where you get comfortable with your equipment and the rhythm of moving through each activity. Balance is required, and we know you can do it! Now on to the blue course where suddenly childhood memories of rope swings and climbing trees comes back to you. Your agility and sense of freedom return and off you go! Up further into the trees you head on the red course. You're feeling confident now and can't help laughing out loud as you zip through the forest or watch your friend try to walk gracefully across a moving obstacle. Now it's time for the ultimate in focus and fitness - the black course. Before you set off, your senses take in the natural beauty and harmony of your surroundings. You climb up even further into the tree canopy discovering that your movements are even more fluid than before. The finish to your adventure arrives and you leave TreeGO® with a smile, a sense of achievement and memories that live on . Extreme Course: After Black course for strong people who want more challenges. Zip lines Course: a series of several ziplines. Blue Sky Course: This course is designed for children between the age of 3-4 and 7. The games and platforms are at 20 to 28 inches from the ground level. Along all the course, parents can help the Kids who are equipped whir harness to do as older children or adults. Yellow Course: Children naturally know how to climb and scramble across obstacles, and this course gives them the practice of managing their own safety lines and movement while honing their physical skills. This course is designed for children between the ages of 7 and 13. To assist our ground patrol staff with supervision of the children, an adult guardian is required to supervise children in his/her care. Guardians can use the walking trails along the course that will allow you to walk and observe your child/children from below as they progress through the course. Different levels of course can be proposed.